This provides a 12-month online subscription to one or more of eight Regional Services, designed for organizations with concentrated business interests. 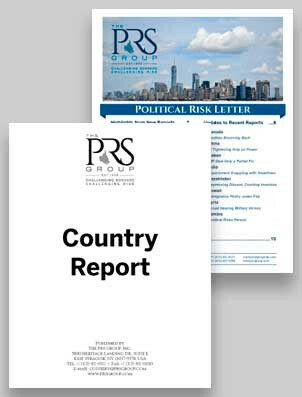 Each region includes access to all of the Political Risk Services Country Reports for each region selected, as well as a complimentary subscription to the monthly Political Risk Letter (PRL). An online subscription includes our Flash Forecasts. The countries included in each region are listed as "More Info" by each volume below. 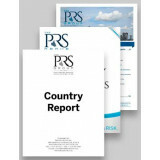 To view a sample Country Report Click Here. NOTE: The product is priced for use by TWO USERS within a corporate department. By purchasing it the users acknowledge an understanding of this. Contact PRS at info@prsgroup.com or +1-315-431-0511 to arrange for a multi-user license, including IP access. PDF file to download monthly during your Regional Services subscription.